Today Jinhyun Choo gave a seminar at the Geotechnical Engineering Office (GEO) of the Hong Kong SAR Government. The talk covered a range of previous and ongoing research topics on computational modeling of geomechanical and coupled multiphysical processes. Discussions were also made on how to practically apply advanced numerical models to slope safety problems. Photo after the seminar, with Dr. Eric Sze at GEO. Jinhyun Choo is invited to give an evening seminar of the Association of Geotechnical & Geoenvironmental Specialists in Hong Kong on 10 July 2018. 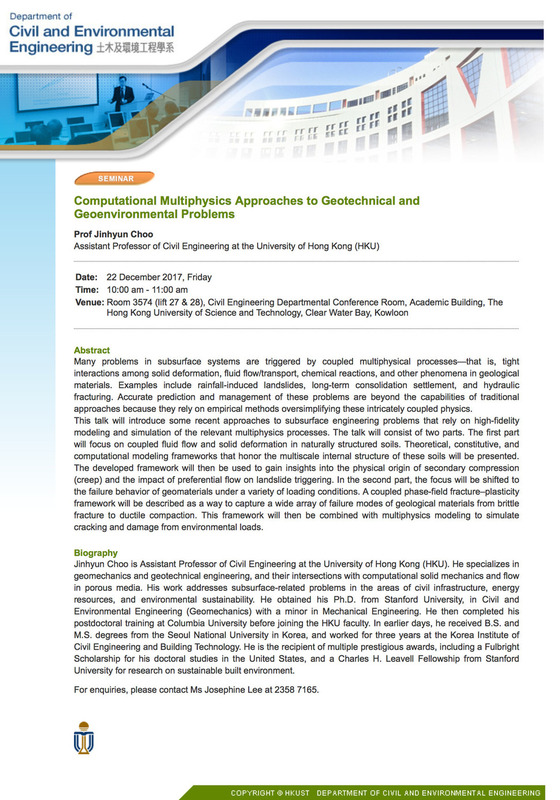 The talk, entitled “Computational multiphysics approaches to geotechnical engineering problems,” will present an overview of our research over the past few years. Photo after the seminar, with Prof. Andy Y.F. Leung at The Hong Kong Polytechnic University. Jinhyun Choo is invited to give a seminar at The Hong Kong University of Science and Technology (HKUST) on 22 December 2017 (Link). It is followed by another invited seminar by Prof. WaiChing Sun at Columbia University.